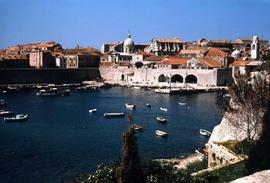 Colour Kodachrome 35mm slide depicts boats at sea and Dubrovnik's Old Harbour. 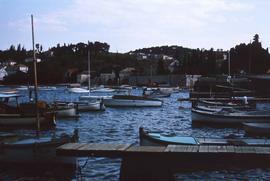 Colour Kodachrome 35mm slide depicts boats in a marina. Colour Kodachrome 35mm slide depicts boats in the water. Colour Kodachrome 35mm slide depicts a cruise ship in a marina, with the words "Zaton, Dubrovnik" on the prow. Colour Kodachrome 35mm slide depicts an unidentified man standing on a cruise ship with colourful flags.